A teacher visits the home of one of her students. Photo Courtesy of Shintoku Kindergarten. 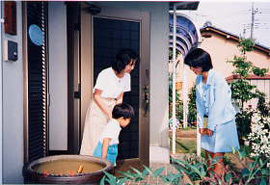 In order to gain a more complete understanding of the child’s environment, homeroom teachers in preschool, elementary school and junior high school will visit the homes of their students. This visitation provides an opportunity for the teacher to see the living environment and a chance to interact with the parents in a setting more comfortable for them. In addition to the home visitations, parents, teachers and students will have joint conferences held at the school. Late in the second year of school and through the middle of the third year, these conferences take on extra importance, because the three now discuss the student’s future, where he or she will apply for school, and other concerns that any of the three have. For high school students, the central themes of these meetings include the decision to continue on to college or enter the workforce.